I think my favorite is that some owners don’t know there are teeth back there. You would think how ignorant but it is true I have had clients look in the back of their horse’s mouth when I had the speculum on and be very surprised how far back their teeth go. Another one I like and have experience with is that some owners don’t like the dentist themselves. I have a couple very good clients that are religious about having their horses teeth examined twice a year but can not watch at all when I work on the teeth. Now I use a dremel at times (sorry Dr. Geoff) and that just makes them leave the barn completely just from the noise and the thought of what the dremel is contacting. Having your horses teeth examined at least twice a year sometimes more often for horses under 5 years of age is necessary to keep them in good health. It also helps with bit comfort and headset. 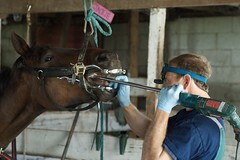 The next time your horse gives you trouble while riding and tosses his head a little, chomps at the bit or even sets its ears back when you make contact with the bit – you need to have your dentist out to check the teeth and even better just have them checked regularly so you do not experience those issues.